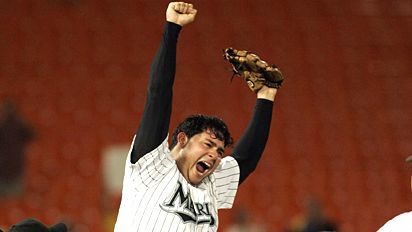 Marlins rookie Anibal Sanchez pitched the first Major League no-hitter in two years. Anibal Sanchez was standing behind the mound when the scoreboard caught his eye, confirming what he already knew: He was one out from a no-hitter. He froze. For a couple seconds, the Florida Marlins’ rookie didn’t move. “I said, ‘Wow. This hitter is the last one,’” Sanchez said. Then he collected himself and, in this year of sensational rookies, finished up the greatest performance yet. One of four rookies in the Florida rotation, Sanchez (7-2) walked four and pitched around an error. He struck out six and threw 103 pitches in his 13th career start. Sanchez finished it off in quick fashion in the ninth. He struck out Conor Jackson swinging on a 1-2 pitch, got Luis Gonzalez to pop out to third and then retired Eric Byrnes on a sharp grounder to shortstop Hanley Ramirez, who fielded the ball carefully on one knee before throwing to first for the out. It’s something special, indeed. For a rookie to do it is just unreal. Here’s a list of every no-hitter in Major League history. Additional comments by Florida Masochist- Sanchez is the 4th pitcher in the short history of the Marlins to pitch a no-hitter. (My boyhood team, The New York Mets, created in 1962, are still looking for their first) Al Leiter in 1996, Kevin Brown in 97, and AJ Burnett in 2001 were the others. This is also just the most recent highlight in an incredible run by the Marlins. On May 21, the team stood 11-31. They are now 70-69 and 2.5 games back in the wildcard race. No one predicted Florida to be where they are today after the fire sale conducted by team owner Jeffrey Loria at the end of last season. With rookies and unknown talents, the team may have played the best in the majors since June 1. This is also incredible because of the turmoil going on at the moment. Loria, and Marlins manager Joe Girardi have been feuding for over a month. All I say is go Marlins. A Mets-Marlins playoff series could be a reality in about a month. Talk about a showcase for my divided loyalties.